Former Boston Red Sox ace Roger Clemens, a seven-time Cy Young Award winner, shares a laugh with emcees Jeff Solari (center) and Tim Throckmorton during Roger Clemens Night at the Anah Temple Shrine building in Bangor on Saturday, March 16, 2019. Former Boston Red Sox pitcher Roger Clemens tells a story during his speaking engagement at the Anah Temple Shrine in Bangor on Saturday night. When he was on the mound, Roger Clemens always had his game face on. 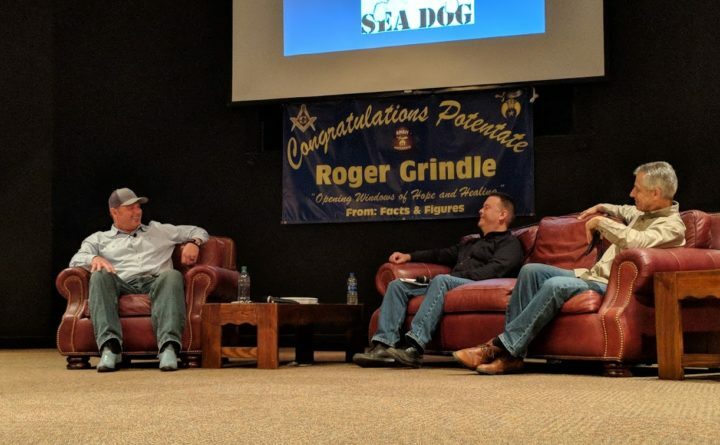 The former major league pitcher, an 11-time All-Star and a seven-time Cy Young Award winner, showed another side of himself Saturday on Roger Clemens Night at the Anah Temple Shrine in Bangor. An engaging and relaxed Clemens entertained an enthusiastic crowd of more than 500 people with humorous stories and answered questions from emcees Jeff Solari and Tim Throckmorton, the sports director for CBS affiliate WABI. The evening was produced by Sportschowdah.com, a division of Solari’s Rock Lobster Media. Clemens earned $50,000 for his appearance. The 56-year-old Clemens looked as though he could still take the mound, although he and his wife, Debbie, who raised four sons, recently became grandparents to twin boys. Despite his awards and stellar numbers, including a 354-184 career record, 3.12 earned run average and 4,672 strikeouts in 4,916 2/3 innings over 24 seasons, he has not been inducted in the Baseball Hall of Fame. Clemens was suspected of using performance-enhancing drugs, but denied the allegations and subsequently was found not guilty of lying to Congress under oath about the issue in 2012. “I’ve been asked about it a million times. It’s old news,” Clemens said during a brief press conference prior to his 90-minute hot stove session. If he is voted in, Clemens said he would wear a Boston Red Sox hat to his induction because the team drafted him out of the University of Texas and he spent his first 13 years with the organization. Two Boston teammates were the subjects of humorous stories: Pitcher Dennis “Oil Can” Boyd, who tried to resurrect his career with the independent league Bangor Blue Ox, and right fielder Dwight Evans. The Red Sox were playing in Cleveland and the ballpark is near Lake Erie. Boyd was pitching and getting hit hard by the Indians. The fog rolled in off the lake, causing a weather delay. As conditions improved, the umpires asked Evans to his position and an Indians coach would hit him a fly ball to gauge the visibility. The coach hit a fly ball down the right-field line. Evans pretended not to be able to see it by sprinting toward center field. The game was called and the Red Sox earned a fog-shortened 6-5 victory. Clemens, who won seven ERA titles and was a six-time 20-game winner, also related the story about almost being scratched from a start against Seattle in 1986. Clemens said he preferred to arrive at the ballpark 90 minutes before a scheduled start. That night, he and his wife got stuck in traffic on the way to Fenway Park. “We moved four car-lengths in half an hour, and so I told Deb to slide over and I got out of the car, got my tennis shoes out of the trunk and was going to run to the ballpark. A motorcycle cop put on his flashers, recognized me and told me to follow him to the ballpark,” Clemens said. Pitching coach Bill Fischer told him he was going to miss his start but Clemens insisted on pitching, despite having a bad headache and not throwing well in the bullpen. “Fisch told them to send a long reliever out to the pen because he didn’t think I’d make it past the first inning,” Clemens said. Clemens pitched a complete game and set the major league record with 20 strikeouts. “After the game, Fisch told me I could get to the game any time I wanted,” he said. The Red Sox reached the World Series against the Mets that year and were one strike away from winning it in Game 6. Instead, the Mets tied it on a wild pitch and won it on a ground ball that went through first baseman Bill Buckner’s legs. The Mets then won Game 7 and the Series. “Bill deserved to be on the field with us. He used to get to the ballpark at 2 for a 7:30 game because he had to ice his ankles. It was bone on bone but he was still out there. He had shoulder and elbow issues, too. He played his tail off for us and I can’t imagine the type of pain he was in,” Clemens said. Clemens enjoyed his time pitching in Boston and New York in “two historic cathedral” ballparks. He said he would have remained with the Red Sox if they had offered him a nice, guaranteed contract but general manager Dan Duquette was reluctant to because Clemens was 34. Duquette and other Red Sox officials thought his career was in decline. Clemens said instead he hit it off with Toronto general manager Paul Beeston, so he signed with the Blue Jays. He also pitched for the Yankees and the Houston Astros before retiring 11 years later. Clemens is busy these days. He works with the Astros and with 25 major league pitchers primarily about the mental aspect of the game. He is an avid golfer, and he and Debbie do a lot of charity work for the Roger Clemens Foundation. While with Boston, the Clemens developed a wonderful relationship with former President George H.W. Bush and former first lady Barbara Bush. Clemens had several family members serve in the military and he thanked those in attendance who had served or were from service families. He praised country singer and friend Toby Keith for all the work he does entertaining U.S. military personnel. Clemens said he thoroughly enjoyed watching the Red Sox outfield play defense last season en route to their World Series title. Clemens expects three of his former teams, Boston, New York and Houston, to contend for a World Series title this season. He said his most prized possession is a baseball bat used by “Shoeless” Joe Jackson. Jackson, who was involved in the infamous “Black Sox” scandal of 1919, was expelled from baseball and never made the hall of fame despite a 0.356 career batting average over 13 seasons. Clemens, who drove to Bangor from New Jersey because his flight was canceled by fog, said he got his work ethic from his late mother. “My dad died when I was 9 and there were six of us. My mom worked three jobs and made sure I had shiny new cleats and a glov,” he said. He concluded the evening by recounting a 1987 dinner while he was in New York to receive the Cy Young Award. “The guy waiting on me was the biggest Yankees fan in the world and he stared at me [angrily],” Clemens said. “I was doctoring up my meal and I needed another cube of butter. But he blew by me. I finally stopped him and asked for another cube of butter. I asked him if he knew who I was.